The bicycle was a popular mode of local transportation and entertainment for individuals in the late 1800s. Special clothing, tools, buttons, and other items associated with bicycling as transportation and sport, were made and sold. At the turn of the century the invention of the automobile brought many changes and development of associated businesses to Canisteo. Importantly was a means of supplying the vehicles with gasoline and mechanical repair. Previous to the invention of gas pumps gasoline was stored in the backroom of a general store and the owner brought it out the customer in a gas can. Eventually gas pumps began to appear. The next station remembered was that of John Burns who built and opened his station around 1920 at 28 West Main Street where the Hubertus Mobil Station is presently located. John sold Socony Gas (now Mobil.) I have an early tire sign that was on his station. Robert Miller, Jr. worked for John before he began working at the Canisteo Bank. Other Canisteo area people that worked at the station were Harold Stewart from Buena Vista, and Ivan Sanford who worked there for many years. Continuing down West Main Street toward HorneIl, on the same side of the road, Kenneth Miller started a new station and sold Esso Gas. This station prospered until it burned in the 1940s. The building was located where Kanisteo Apartments (owner Rita Thomas) now stands. Across the road coming back toward the village at 47 West Main where Canisteo Auto Mart is presently located, Leon Burns started a Tydol station that was in business for many years. He also sold used cars. (Leon was a distant cousin of John Burns.) The station was torn down (1950s) and a new one built of a design for the owner/operator to have living quarters in part of the station. Rotary Gas was sold in the new station. Ell's and Rod's Sunoco Station formerly owned by Ells Henry and Rod Teribury. The present owner is Dave Harding. An earlier station at that location was owned and operated by Otto Stephens later owned and operated for many years by his younger brother Kenny. I don't know the date when it began. Moving east down Main Street at 15 West Main on the corner of Orchard Street, was a station from which Jim Hendee sold Sinclair Gas. The station probably originated in the 1920s. Later Roland Harvey and Carl Gillis took over the station, and ran a Chevy agency and garage in the building behind it for many years. This was the site of the former Gospel Tabernacle (see the book "Past to Present" published by Kanestio Historical Society 1995.) Eventually it was an auction house for a short time before the roof collapsed under heavy snow. Ken's Auto Collision presently occupies the site. Across Orchard Street on the opposite corner at 13 West Main was the Go-Gas Station. Watches Law Office is presently located in this building to which additions have been made. 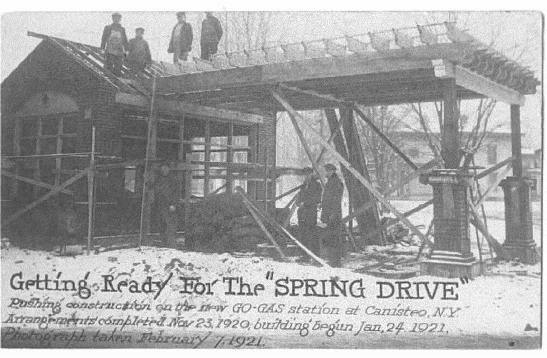 There exists a picture of the station under construction stating the date of the picture was February 7, 1921. This station was in operation until about 1940 and the last person to operate it was Sargent Miller. Sarg was the son of Robert Miller who owned the former Miller and Crozier Grocery Store (currently Smith's Furniture Mart) on the comer of Greenwood Street and South Main Street. Warren Dennis started work in the station the same time that Sarg did but then worked elsewhere. At 11 West Main, the end of the short block where the Go-Gas was located was the Garman Ford Agency that started business about 1910. Later in the 1920s there were gas pumps located on the curb in front of it. The Steuben County Rural Ministry coordinated by Sister Conlith is presently located in this building. Behind Sister City Park at 12 South Main Street Pete Madison and Bob Ells started a Chevy Agency about 1930, which continued for a while. I am not sure if they had gas pumps. Walt Flohr built a station adjacent to the Tannery at 5 East Main Street about 1926. It was operated by Walt for a while and then for a longer time by his brother Bill Flohr. I used to buy gas there for my 1920 Buick before driving to Hornell to work. Warren Dennis also ran it before it was eventually owned and operated by Glen Galbraith who sold Texaco Gas in the 1950s. Dale Wilson, Sr. worked at the station. Other businesses occupied the building after it was a gas station, among them a dairy bar and the current Norman and Pogue Accountants' business. Across the street at 2 East Main a Texaco Station was built by Roy Rogers in the 1950s and operated by Franklin J. Smith for many years. The station was later owned by Glen Dickey. Currently the Uni-mart Store is located on the Texaco Station site. Traveling to end of East Main Street on the northwest comer of Main and Ordway Lane, Seymour Mowers put up a gas station with a driving golf course behind it - about 1930. He ran the station for a while and then in the early 30s it was bought by Raymond ("Pat") Perkins who sold Mobil Gas. This station was in business for many years and Ronnie Payne from Jasper worked there. Eventually the building was sold and moved to the east end of Fourth Street (north side) where it was made into a small home. Raymond built and operated a new station on the site until the mid 1950s when it was operated by Gerry Allen who sold Esso Gas. Going back to Canisteo Four Comers, on the northwest corner of Depot and Main Streets, a gas station was built in the 30s. The first person that I knew who operated it was Ernest Davidson. It was later taken over by Albert Pfitzenmaier who modernized and operated it for many years, selling Gulf Gas. His Son Robert (Bob) eventually became owner and operator until approximately sometime in the 80s. Others leased it for various times after that. The Site currently is awaiting construction of a new business. Heading South at 135 Greenwood Street (on the left side of the road) before crossing the bridge, was a gas station operated by Mr. and Mrs. Norton. This probably started in the 1930s and was operated for some years until the couple's ill health caused them to close it. Their daughter Ruth (who married a Smith) took over the property as well as one or two houses toward the downtown side of the station. The station was built over into a home, enlarged, and is the last house on the left before going out of the village. NOTE: The Kanestio Historical Society is organizing a collection of pictures of gas stations and vehicle associated businesses that were located in the village. We welcome any pictures that can be donated or loaned for copy for the collection. Please contact: George Dickey at 607-695-2360, Sally Florence at 607-698-2556, or volunteers during hours that the Historical Society is open.